Wise are one of the biggest and most established Chips companies in the world. Their bag designs will understandably have a bit of a corporate feel. The flavors are color coded, with nice shaded areas to compliment the colors. The Wise logo has shrunk and altered over the years but it is highly visible, recognisable and very well designed. The rotated square is original and not copied. The graphic images of the lime and pepper are modern and work well with the flavor wording. Not as thin as some Chips of this cooking style, and this led to a crispy munch. The snap, crackle of the Chips provided a refreshing and snappy crunch. There were some browned edges and some dark circles on the Chips. There were a few larger than normal Chips in the bag, and there were not many broken members of the club. There was also some nice looking seasoning. There were however, no major oil bubbles and cratered surface areas to create that all important texture character. You have to love the way Chips manufacturers label Pepper & Lime flavor, with a Mexican twist. 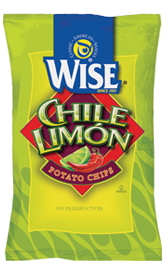 Admittedly, they are popular South of the Border, but an ideal Chile Limon Chip would provide a wave of hot Chile and related spices with a tangy burst of citrus flavoring. Maybe even a mildly savory heat with a tangy twist. But no. These were a lemony lime flavor with a slight hint of peppery heat. You may need a hot sauce dip to create the flavor you hope you are going to get from the exciting bag labeling.